Canadian flutist Susan Hoeppner is highly regarded for her lyricism, dazzling virtuosity and “no holds barred” approach to performing. She is an established international soloist and chamber musician, and her appearances include prestigious venues spanning the continents of North America, South America, Europe, and Asia. And then there’r;s charismatic French harpist Emmanuel Ceysson. A major figure in the harp world (he is the principal harpist of the Met), ‘Ceysson’ was not a particularly resonant name with Winnipeg audiences when he played a ravishing debut concert with the MCO in 2016. No matter. The show was the sleeper hit of our season, prompting audiences to rush to the box office to inform us that they’d just experienced one of the best performances of their lives. It’s little wonder then that his December concert with the MCO has been one of the top sellers among our subscribers. This may also have something to do with the fact that he’s once again playing Debussy’s impressionistic Danse sacrée et danse profane, which promises to transport us to a meadow in fin-de-siècle France. 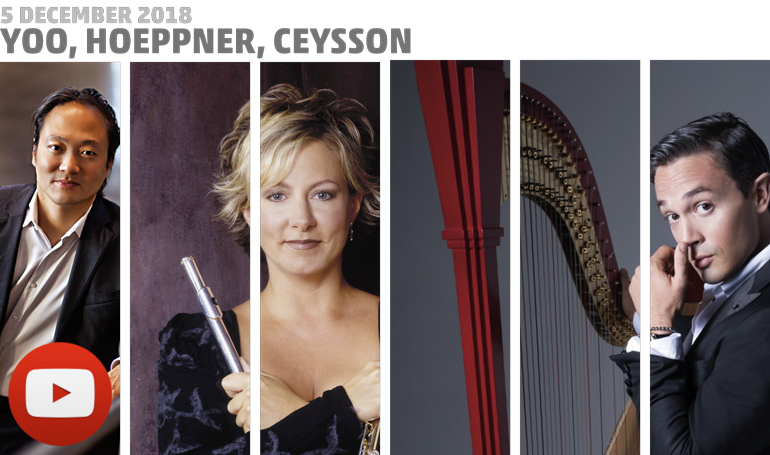 After the Debussy, Hoeppner joins Ceysson under the baton of conductor Scott Yoo for a performance of Mozart’s Concerto for Flute, Harp, and Orchestra in C Major. Performances of important works by beloved contemporary composers, Dan Coleman and Canadian Christos Hatzis, round off what is sure to be one of the most magical Winnipeg concerts this winter. A cherished and dynamic figure on the MCO stage, Scott Yoo is currently Music Director and Principal Conductor of Festival Mozaic, and Artistic Director of the Medellín Festicámara, a chamber music program for underprivileged young musicians. Evening concert at 7.30pm; hour-long matinee concert at 1.00pm; both concerts on December 5th at Westminster United Church, 745 Westminster at Maryland. Tickets, at $35 for adults, $33 for seniors and $15 for students and those under-30 (incl. GST), are available at McNally Robinson, Organic Planet (877 Westminster Ave), and on MCO’s Ticketline at 204-783-7377. Concertmaster sponsor / Raymond Hébert and Terracon Development Ltd.
After beginning his musical studies at age three, Scott Yoo performed Mendelssohn’s Violin Concerto with the Boston Symphony at 12. He received first prizes in the 1988 Josef Gingold International Violin Competition, the 1989 Young Concert Artists International Auditions, and the 1994 Avery Fisher Career Grant. In 1993, Mr. Yoo founded the Metamorphosen Chamber Orchestra, conducting the ensemble in its series at Jordan Hall in Boston, and more than ninety performances on tour. Scott Yoo has collaborated with such eminent artists as Sarah Chang, Edgar Meyer, Benita Valente, and Dawn Upshaw. He is currently Music Director and Principal Conductor of Festival Mozaic, and Artistic Director of the Medellín Festicámara—a chamber music program for underprivileged young musicians. In 2016, Yoo was appointed Artistic Director and Chief Conductor of the Mexico City Philharmonic Orchestra. As a guest conductor, Scott Yoo has led the Colorado, Dallas, Indianapolis, New World, San Francisco and Utah Symphonies. He conducted the Saint Paul Chamber Orchestra in their Elliott Carter Festival, and at Carnegie Hall with pianist Brad Mehldau. Abroad, he has conducted the City of London Sinfonia, the Britten Sinfonia, the Ensemble Orchestral de Paris, Odense Symphony, the Seoul Philharmonic, and the Yomiuri Nippon Orchestra. He has recorded for Sony Classical, Naxos, and New World, and is currently recording the complete Mozart Piano Concertos for Bridge Records with the award-winning Russian concert pianist Vassily Primakov. Canadian flutist Susan Hoeppner is highly regarded for her deeply lyrical phrasing, dazzling virtuosity, and a “no holds barred” approach in her performances. She is an established international soloist, recitalist and chamber musician, and her appearances have spanned North and South America, Europe, Japan, and China. Ms. Hoeppner has performed as guest soloist with numerous orchestras around the world and has been invited to perform at many Canadian Embassies including London, Belgrade, Tokyo and Mexico. She has inspired renowned Canadian composers Christos Hatzis and Gary Kulesha, among others, to write pieces for her. Susan is a JUNO nominee. Her numerous recordings are available on labels including Marquis Classics, EMI, Centrediscs/Naxos and Grammophon BIS. Her recent Canadian Flute Masterpieces recording with pianist Lydia Wong was released on Centrediscs/Naxos, as was her newest chamber recording, released in 2018, featuring pianist Lydia Wong and cellist Winona Zelenka, and works by Alice Ping Yee Ho. A graduate of The Juilliard School, Ms Hoeppner has also become an esteemed mentor. She is a member of faculty at the Royal Conservatory’s Glenn Gould School, The Taylor Academy for young gifted artists and the University of Toronto. Every summer she gives classes and performances at Le Domaine Forget in Québec, and Campus Internazionale della Musica d’Arte (CIMA) in Italy. Susan Hoeppner has been appointed a Wm. S. Haynes Artist by the world-renowned Boston-based flute company. As their Canadian Artist, she represents them in performances and masterclasses throughout the world. Emmanuel Ceysson is one of the world’s leading harpists. He recently took the position of Principal harp at the Metropolitan Opera House, after a successful tenure at Opéra de Paris lasting nine years. Since 2005 he has been a presence in such leading international venues as Wigmore Hall, Salle Gaveau, Carnegie Hall, Vienna Konzerthaus, and Berlin Philharmonie, where his appearances in recital, concerto repertoire and chamber music regularly win high praise. His unfailing commitment to his instrument has earned him the highest international distinctions. In rapid succession, he won the gold medal and a special performance prize at the USA International Harp Competition in 2004, first prize and six special prizes at the New York Young Concert Artist Auditions in 2006, and First Prize at the prestigious ARD Competition in Munich in 2009, thus becoming the first harpist to obtain awards at three major international events. Recent concert highlights include the Glière Concerto for Harp with the Grazer Philharmonisches Orchester at the Stefaniensaal of Graz and with the Prague Radio Symphony at the Gstaad Festival. Upcoming chamber music engagements include performances at the Hong Kong Chamber Music Festival; a recital at the Frick Collection, New York, with Quatuor Voce; and his debut with the Chamber Music Society of Lincoln Center in 2019. Upcoming performances also include solo recitals at the Teatro del Lago (Chile); appearances at the Artist Series Concerts of Sarasota; and performances of Fauré Impromptu for Harp, Op. 86 (Hong Kong), Mozart Concerto for Harp and Flute K. 299 with the Vivaldi Orchestra (Italy), and Rodrigo’s Concerto de Aranjuez with Orchestre de Cannes. Mr. Ceysson has been a recording artist with Naive records since January 2012 when he released Opéra Fantaisie, a solo album based on famous operatic arias. He has given recitals and educational residencies at countless international venues including the Wolf Trap Foundation, North Orange County Community Concerts Association, Macomb Center for the Performing Arts, Mary Baldwin College, the Washington Center for the Performing Arts, and Emporia Arts Council. Christos Hatzis’ music is well-known in Canada and around the world. Covering a vast range of styles and genres, his works have been recorded, performed and broadcast throughout the world. Hatzis was born in Volos, Greece, and his early musical studies took place at the Hellenic Conservatory of Greece in his hometown. He continued his studies in the United States, where he earned degrees from Eastman School of Music and SUNY. In 1982, he moved to Canada, having decided that the country’s multiculturalism was more suited to his own ethos. He became a Canadian citizen in 1985, and joined the faculty of the University of Toronto in 1995. Hatzis’ work has received considerable attention in recent years. With regular commissions, recording projects, and performances of his work throughout the Americas, Europe, the Middle-East, and East Asia by leading soloists and music ensembles, “Christos Hatzis is currently enjoying a growing international reputation as one of the most important composers writing today” (CBC Records). The composer is the recipient of several national and international distinctions, and a number of his works have been released on CD. It is not unusual for a Hatzis work to become a signature piece for a soloist or an ensemble. His Old Photographs and Dance of the Dictators have been performed by the Gryphon Trio hundreds of times all over the world. There have also been a number of all-Hatzis programs over the past few years. Hatzis’ music is inspired by proto-Christian spirituality, his own Byzantine musical heritage, world cultures, and various non-classical musical genres such as jazz, pop and world music. His strongest inspiration is his faith, and his religious works have been hailed by critics and audiences alike as contemporary masterpieces. In addition to composing and teaching, Hatzis has written extensively about composition and contemporary music. Dan Coleman is a composer and music publisher. He studied music at the University of Pennsylvania, the Juilliard School, and the Aspen Music Festival and School where his teachers included George Tsontakis, George Crumb, William Bolcom, Robert Beaser, Stephen Albert, and Bruce Adolphe. In 1994 he won the Young Concert Artists composition competition. His music has been commissioned and performed by leading ensembles including the American Composers Orchestra, The Chamber Music Society of Lincoln Center, Cypress String Quartet, Dallas Symphony, Fresno Philharmonic, Honolulu Symphony, Indianapolis Symphony, Knoxville Symphony Orchestra, Mesa Symphony, New York Chamber Symphony, Orpheus, Pacific Northwest Ballet, San Jose Chamber Orchestra, San Luis Obispo Mozart Festival Orchestra, Seattle Chamber Music Society, St. Luke’s Chamber Ensemble, Saint Paul Chamber Orchestra, Utah Symphony, and the Tucson Symphony Orchestra, where he has been composer-in-residence since 2002. In 2004 he and Bob Donnelly founded Modern Works Music Publishing, an independent music publishing administrator. The composer has provided the following note. Serenity, the second movement, is dedicated to the memory of Bertha Modlich, an inspirational woman who passed away just shy of her 105th birthday. Bertha lived alone, ran her own house and a pottery workshop, played the violin and did sports (mostly rowing) until the very end of her life—a remarkable feat for a woman of that age. She modestly attributed her longevity to her daily dose of Lindt chocolate (from the factory on Lake Zurich, right across the lake from her family home) but I think her secret was her perpetual optimism and her determination to always see the best in other people no matter what the circumstances. Bertha experienced hardships in her life, like living in Berlin as a young woman and mother of two during the allied bombings of the city and the material deprivations that followed the fall of the Nazis, but she always focused on the positive aspects of life and had a way of making other people feel important. The music of Serenity follows her lead: there are clouds but they are short-lived and the music returns quickly to sunnier vistas. The latter part of Serenity is a song without words. As I was writing it, immersed in my loving impressions of Bertha (and perhaps her own ghostly presence), I imagined her dancing away into eternity in this movement’s unpretentious, slow waltz melody that seems to exist on its own terms and against all conventional wisdom about human limitations. Progress Blues, the final movement, is a meditation on the nuclear disaster of Fukushima; not on the accident itself, but on the lessons that can be learned from our unwarranted and single-minded faith in technological progress. Even though the tsunami caused more human tragedy than the near meltdown of the nuclear reactors, the latter event may end up having a more transformative effect on the Japanese psyche than any act of God, however devastating. Japan’s history is marked by two nuclear disasters 66 years apart, one at the end of the Second World War and one in our days. After the Hiroshima and Nagasaki holocaust, Japan embarked on a path of technological development and exuberance, which, although it brought a great deal of material and emotional satisfaction and wealth, also caused fissures within the Japanese psyche and society that are only recently becoming visible to everyone. The music follows this path of exuberance, which is not that different from that of the first movement, although in Progress Blues it is more relentless, more impulsively driven. Its fissures show occasionally, as in the “wobbly” phonograph effect that exposes the emotional pretentions of the Hollywood-like treatments of the main theme and the “ticking clock” metaphors of the string pizzicati. Introspection is not absent for long (even the Hollywood-like theme undergoes a dark rethinking as a fugato), but the sheer drive forward, and the forces that have given it impetus in the first place, repeatedly succeed in sidetracking any attempt to question this relentless drive and the dire consequences that it may engender. At the apogee of speed and energy, the music suddenly collapses, the clocks keep on ticking ominously and then … well, I will let the music tell you what happens next. Progress Blues is dedicated to the victims of falsely understood “progress” in Fukushima and elsewhere. In an essay entitled Opinion or Insight? Arnold Schoenberg writes, “Just as tones pull toward triads, and triads toward tonality, gravity pulls us down toward the earth; yet an airplane carries us up away from it.” Schoenberg’s charming analogy inspired me to compose a piece that was the musical equivalent of an aerial view: direct, tonal materials are transformed into a non-tonal complex of sound. Parables of Flight was commissioned by Scott Yoo for the Metamorphosen Chamber Orchestra in 1996, as part of the national series of works from Meet the Composer/Arts Endowment Commissioning Music USA, with support from the Helen F. Whitaker Fund. The work lasts approximately 18 minutes and is divided into three continuous movements: Prologue, Eclogue, Epilogue. In 1904 celebrated French instrument manufacturer Pleyel asked Debussy to compose a piece to demonstrate the capabilities of a new type of harp they had developed. The music would also serve as a test piece for a course of study on the new harp to be offered at the Brussels Conservatory. Pleyel’s harp failed to catch on, but Debussy’s lovely, evocative pair of dances has remained popular. The first performance took place in Paris on 6 November 1904. It has a whiff of ancient times, an atmosphere dear to Debussy. Sacred Dance, the piece’s opening section, is slow and ethereal, almost ritualistic in nature. It quotes from a piano work by a contemporary of Debussy, Portuguese composer Francisco de Lacerda. The animated, almost celebratory Profane Dance follows without a break. It too quotes from other music, namely a Spanish folk tune that Debussy also drew upon for two of his Préludes for solo piano. This enchanting work dates from Mozart’s ill-fated sixteen-month tour of 1777-78. He hoped it would secure him a better job than his under-appreciated position in his home city of Salzburg, but it was not to be. After visits to Munich, Mannheim, and Augsburg, he and his mother arrived in Paris in March 1778. Over the next six months, he met with the same indifference he had encountered at his earlier stops. This was due at least in part to the French remembering him as the precocious seven-year-old of his previous visit, not as a mature composer. He found the city expensive and dirty, and the music-making entirely superficial. To make matters worse, his mother died on 3 July. The period wasn’t totally fruitless. A new ballet premiered on 3 June. He contributed roughly one half of the music for Les petits riens (The Little Nothings) as a favour to an old friend who was the ballet master of the prestigious Paris Opéra company. The debut of Symphony No. 31 in D Major (nicknamed ‘Paris’) on 18 June proved quite successful, as Mozart was careful to tailor it to the Parisian taste for colour and brilliance. In April, a wealthy French nobleman, Adrien-Louis Bonnière de Souastre, asked for a flute and harp concerto. He played the flute quite well and, as an aspiring musician, his daughter’s harp-playing was “magnifique,” to quote Mozart. Mozart also gave her lessons in composition—fruitlessly, as it turned out, as she lacked both creativity and diligence. Mozart faced several problems with de Guines’s commission. He disliked both featured instruments (or at least he claimed he didn’t care for the flute; he may have made his oft-quoted criticism of it in anger or jest). Whatever the case, he created a sunny and utterly charming work to showcase both solo instruments—but he was never paid for it. The count had been recalled from London in 1776, due to a lawsuit resulting from irregularities in his business affairs, so this reneging may have been predicted. With this concerto, Mozart contributed to a Parisian vogue. The symphonie concertante, a hybrid of symphony and concerto featuring multiple soloists, was all the rage. The modest accompanying orchestra in Mozart’s concerto creates transparent textures that never mask the delicate sounds of the soloists. This, alas, was to be the only time he wrote for the harp. The concerto’s outer movements are all charm and graceful energy. The slow second movement inhabits a different world. Temporarily banishing the orchestra’s wind instruments, Mozart backs up the soloists with a glowing cushion of strings that’s entirely appropriate to this warm rococo music.